A challenging game for NES Zapper experts. You have been sent to retrieve the cure for an alien virus from a research facility at the edge of the solar system. Now you must return to the Earth, fighting your way through squadrons of enemy craft. The ship flies automatically, and you have to focus on taking out the enemies before they do too much damage to your ship. 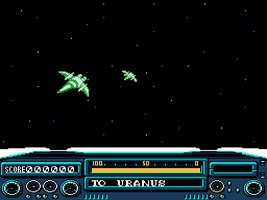 Some enemies fire bullets, causing a little damage, while others launch slow-moving missiles that must be taken out or risk losing a massive chunk of your shields. 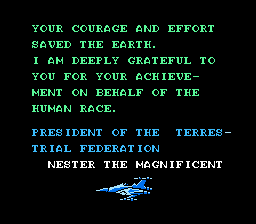 Upon returning to Earth and completing the game, you receive a message from the President of the Terrestrial Federation, Nester the Magnificent. Nester was a comic character in the U.S. Nintendo magazine, Nintendo Power.